The original house, the residence of Gideon Granger, Postmaster of the United States, was begun in 1802 then sold by him in 1808. With the arrival of the government came people of means to build prominent, private houses. Among them was Timothy Caldwell of Philadelphia, a wealthy bricklayer. He purchased the property at Eye Street, 194 I north (as was the address of the property until 1858) and set out to erect what he would describe as the most handsome house in the Capital City. 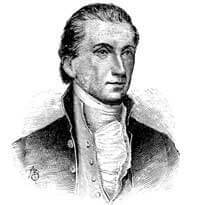 James Monroe came to Washington as Secretary of State in 1811. There is evidence that he was living at the house when the British invaded Washington in the War of 1812. It is said that President Madison, Secretary of State Monroe and Secretary of War Armstrong held a grave conference in the house on the day of the invasion, August 24, 1814. All three were in Bladensburg when the battle began, so it is presumed that the conference must have occurred after their return to the city. There is a legend, which has continued as part of the lore of the house, that President Madison rode his horse through the front door and out the back to join the Monroe’s and Mrs. Madison (who was staying at the Monroe house at the time) in their flight to Virginia to escape the oncoming British. The Monroe’s remained in the house until September 17, 1817. At that time, they left the house as President and First Lady of the United States to move into the White House, newly rebuilt and painted white after destruction by the British. The property was sold to Professor Cleveland Abbe, America's first weatherman, on June 20, 1877. Professor Abbe, a prominent meteorologist, is the first man in America and one of the first in the world to have made successful day-to-day predictions for a government weather bureau. He is remembered as the father of the U.S. Weather Service. Inspired by the London's Chelsea Arts Club and the National Arts Club in Manhattan, Washington Artists created their own club in May 1916 and purchased the Monroe House as its home. With a focus on painting, sculpture, music, and drama, the Arts Club provided a contrast to Washington's more traditional clubs. It was also the first club in the nation's capital to admit men and women. Acclaimed sculptor Henry K. Bush-Brown was the first president. His portrait, painted by his wife Lydia, now hangs above one or the Club's first-floor fireplaces. From early on, the Arts Club welcomed a broad array of professionals, industrialists, philanthropists, scientists, and political activists. It quickly became a favorite destination for visiting New York and Hollywood luminaries, including D.W. Griffith, Claudette Colbert, F. Scott Fitzgerald, and Tallulah Bankhead. From the Roaring Twenties to the Swinging Sixties, the Club's New Year's Bal Boheme was the hottest ticket in town. The Arts Club of Washington builds on its distinguished cultural, social, and architectural traditions as it continues to evolve as a presence in the city. As an art gallery...a site for performances and programs, a symbol or preservation in action, and an elegant and congenial gathering place for members and their guests, the Arts Club's link to Washington and its history endures.